Standard - €38.99 Only 4 left! If you wanted an amazing hairdo in the 18th century, you had two options. You could spend a good chunk of your day brushing and primping your hair, applying whatever kinds of styling products were available back then (we don't know, bacon grease, maybe? ), until you either came up with something you liked, or ran out of light. Or, you could be the queen, and make your servants do it for you, while you ate cake and planned your next royal dance party. It's really a tough choice, when you think about it! 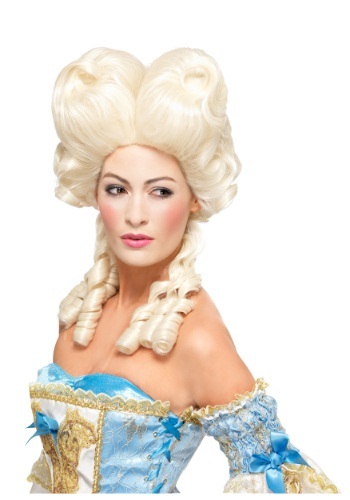 Luckily, in the two hundred-ish years since then, mankind has gone to the moon, invented cell phones, and created fantastic wigs like this Deluxe Marie Antoinette Wig to make our lives easier. This high quality costume wig is styled in a tall, regal looking bouffant, with draped ringlets on the sides. It's a queenly hairdo that doesn't take a palace staff to achieve!